Motor are not intelligent, if not protected it, they will work themselves to death. It is the electrician responsibility to protect them properly. A properly protected motor will last for many years. Lighting: Use lighting controls to automatically turn lights on and off as needed, and save energy. Of course you can save energy by turning off lights when they’re not needed, but sometimes we forget or don’t notice that we’ve left them on. 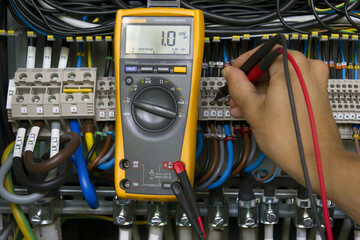 As the electrical and electronic industries continue to merge, our electricians are prepared to help both homes and businesses meet this challenge.We can design a secure layout using specialty lighting controlled by timers, lighting contactor, control panel, motion sensors, photocells for dusk to dawn operation, dimmers, switches or just using your smart phone. It’s not always possible to give you a completely accurate estimate without doing some direct troubleshooting. One electrical problem can have a number of causes, and our experts will need to look at the entire situation and trace the electrical trouble to its root cause. When calling about electrical repairs, you’ll likely get our hourly rate. But trust that within the first hour of electrical troubleshooting, our professional electricians will have either completed the electrical repair, or they will be able at that time to give you an accurate estimate of the electrical work to be done. Anything in your electrical system – we can assess it and give you a firm bid.